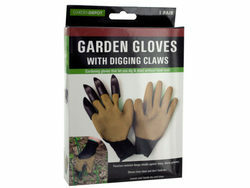 Dig and plant without hand tools with these unique Garden Gloves featuring durable, comfortable gloves with 4 hefty claws made of durable ABS plastic on the right glove. Emulsion foam construction gives comfort and ventilation. Flexible elastic knit cuffs provide a snug fit. Non-slip surfaces protect hands while puncture-resistant design shields against sharp, thorny greenery. These gloves are a one-step solution to handle a variety of gardening tasks while leaving your hands dry and clean. Gloves rinse clean and don't hold dirt. One size fits most. Comes packaged in a hanging box. Box measures approximately 5.125" x 1.375" x 7.75".